While researching neighborhood safety, quality of life and environment data, Revaluate uncovered an unusual trend in the business of love. Between Chicago and San Francisco, Revaluate revealed almost 100,000 reports of lewd acts since 2001. That stat alone is staggering, but it’s not shocking. More interesting is the fact that these reports are rapidly dwindling. The data we’ve uncovered indicates a sharp drop in police reports, complaints and reported incidents of prostitution, lewd sexual acts, and public indecent exposure. In Chicago, as you may know, the trend had been climbing for years, but recently the records have been dropping – and dropping rapidly. 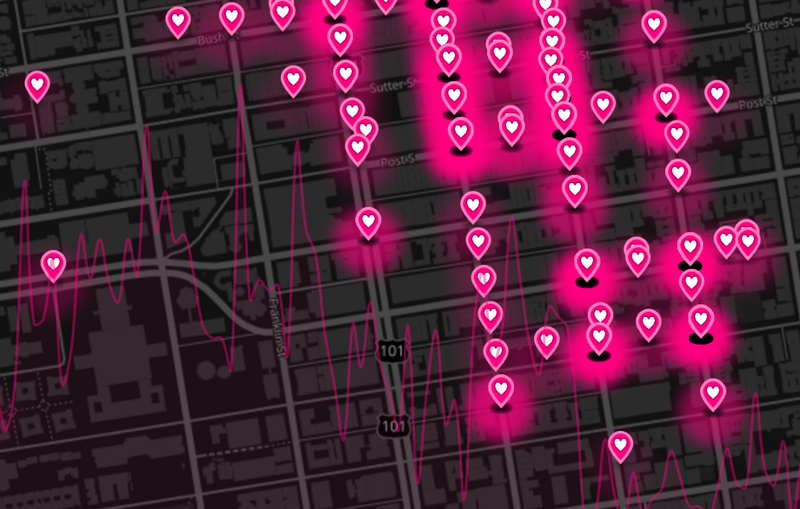 The Hot Beds of Love map illustrates this data for Chicago. In recent years, trend lines indicate that these Love Hot Beds have gone cold. The oldest profession in the world is not legal in Chicago. It’s only legal in a few low population counties of Nevada – where it’s regulated and taxed like other professions. The map shows that arrests, complaints and reports are down big, but do we really think demand has dropped proportionately? No, but this data does correlate with the growth of a totally unrelated industry. Is the business of love in Chicago failing? The advancement of technology, the proliferation of smartphones, and the launch and wild success of several dating and hookup apps are likely the chief catalysts. Selling love is not gone, it’s just not in plain view on the side of the road. This kind of love has existed since Fred met Wilma behind the bowling alley. Today, there are just a lot more options for keeping it legal and on the downlow. Those beds are still plenty hot. Chris Drayer is the co-founder of Revaluate. Connect with him on LinkedIn and on Twitter @FPO.